F-16 Fighting Falcon (also unofficially known as Viper) has been one of the most famous multi-role combat aircraft in the world for the last three decades and the backbone of United States Air Force. 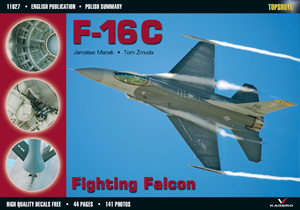 The development work on F-16C/D (single- and two-place counterparts to the F-16A/B) commenced in early eighties. The upgraded version differed from earlier F-16 A/B by new electronics (esp. AN/APG-68 radar with increased range, better resolution and more operating modes), which vastly enhanced its combat capabilities. The aircraft could also be armed with the latest AIM-120 AMRAAM medium-range air-to-air missiles as well as AGM-65D Maverick air-to-ground missiles, fitted with imaging infrared guidance system. The F-16 C/D Block 25 was initially powered by earlier Pratt & Whitney F100-PW-200 turbofan, rated at 64.9 kN (106.0 kN with afterburner). The following production blocks (30 and 40) were coupled to the new General Electric F110-GE-100 turbofan, rated at 76.3 kN (128.9 kN with afterburner), whilst Block 32 and 42 were fitted with P&W F100-PW-220 powerplants (later also retrofitted to Block 25). The F-16 has been continually upgraded throughout its production history, its avionics constantly modernised and its weapon assortment significantly widened. The construction also underwent structural upgrade, which lowered its radar echo. Block 40/42 (so-called F-16CG/DG) gained capabilities for navigation and precision attack in all weather conditions and at night. Block 50/52 (F-16CJ/DJ) is the latest variant to equip USAF. F-16C/D Block 50 is powered by General Electric F110-GE-129 turbofan rated at 76.3 kN (afterburning 128.9 kN), whereas Block 52 by Pratt & Whitney F100-PW-229 turbofan rated at 75.6 kN (afterburning 127 kN). Again the avionics was upgraded, incorporating, among others, Northrop Grumman APG-68(V)7 radar and an upgraded data transfer unit. The most modern F-16 C/D to date is Block 50/52+ (Block 50/52 Advanced), which introduced APG-68(V)9 radar, provisions for conformal fuel tanks and new types of ‘smart weapons’ like JDAM (Joint Direct Attack Munition) bombs. The F‑16 Block 50/52+ are produced for export only. Based on Block 50/52 and 50/52+ variants is F-16I Sufa (‘Storm’), manufactured exclusively for the Israeli Air Force (IAF). 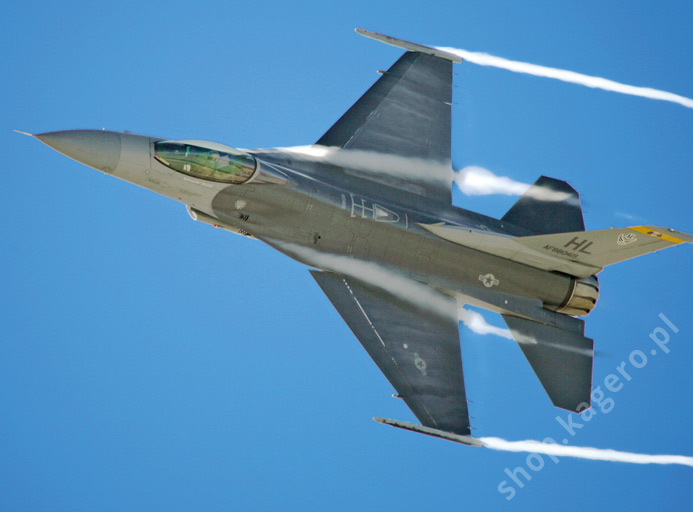 At present, the most modern and expensive F-16 of them all is Block 60, sold only to the United Arab Emirates. It differs so much from its predecessors that it was designated F16E/F. F-16C/D is the most numerous version of this aircraft. So far, over 2400 F-16s C/D have been produced by Lockheed Martin plant in Fort Worth, Texas (until 1992 General Dynamics) as well as on licence. The F-16 C/D is (or will be) used by the following countries: Bahrain, Chile, Egypt, Greece, Israel, South Korea, Singapore, Turkey and USA. Also Poland will receive (in late 2006) first machines from a total of 48 F‑16s C/D Block 52+, of which the last are expected to be delivered by 2009.